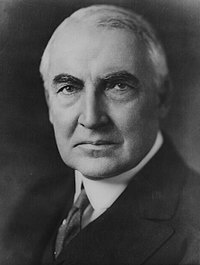 Va Warren Gamaliel Harding (2 Mee Houney, 1865 - 2 Luanistyn, 1923) ny 29oo Eaghtyrane ny Steatyn Unnaneysit. V'eh ayns oik veih 4 Mart, 1921 derrey 2 Luanistyn, 1923 (date e vaaish). Hie yn duillag shoh er ny reaghey er 11 Mayrnt 2013, ec 10:13.